Give Yourself a Creative Start to 2018! Our students are what make our community so special. We have students in our advanced studies program that have moved here from as far away as California and Maui. 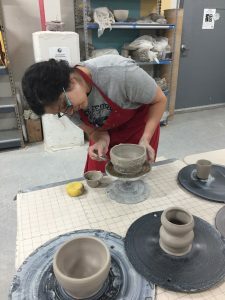 We also students who touched clay here for the first time and after taking classes for several years are now on their way to becoming professional potters. If you haven’t taken a class yet at The Village we want to encourage you to now. 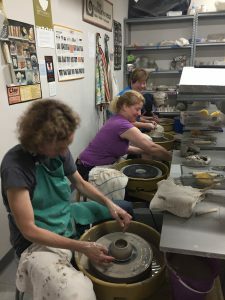 Daily we hear from our students of every walk of life from full time professionals, stay at home Moms, and retirees, that making pottery has transformed their life. It’s meditative, inspiring, challenging, and life giving. Can something as simple as a lump of clay do this? Yes! In fact, in the same way you form a pot out of a lump of clay you can also craft your life. Whether you work full time or are retired, nurturing your creative edge brings joy, fulfillment, and relationships. This is not an overstatement, it’s the truth. We are designed to create, to make. You are designed to create. More a nd more, in these times we live in, we have to be intentional to tap into our creative edge. Here at The Village Potters we create a community that is filled with life and creativity. The perfect place to explore. Come take a class and you can study with exceptional instructors, potters who love to partner with you as you explore making pots. Our staff not only makes great pots, we make great potters! For a limited time, First Time Students may sign up for a six or eight-week session of classes in wheel or hand building, and receive a 10% discount on your session fee. This discount, valid for first time students only, is good for classes purchased through January 3, 2018, and is redeemable by using the coupon code holidayclass17 at checkout. You can register by calling 828-253-2424, or Register Online.